Sonic Generations had its issues, but it was largely a return to form for 3D Sonic games as it blended together the modern gameplay with some throwback. It was also largely a nostalgia trip, as it recreated levels from the series’ past. There’s only so many nostalgia plays a series can do before it starts seeing a diminishing return, and I was looking forward to seeing something new after Sonic Mania failed to captivate. 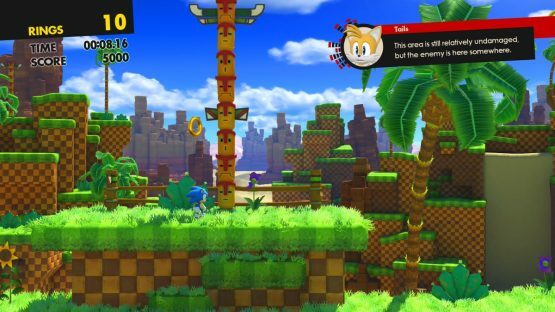 The gameplay in Sonic Forces is very familiar to Sonic Generations, as players will run forward in heavily scripted 3D spaces. Mechanically, it’s not the most gripping game, and there’s a totally fair complaint to be made about a lot of the levels feeling like they’re on-rails (sometimes quite literally), but there’s typically enough pitfalls and jumps that the player has to make for the stages to be engaging. There’s a positive trade-off here, though, as the game is filled with Uncharted-like scripted sequences where all sorts of destruction and spectacle are happening around Sonic running really freaking fast. Heck, early on there’s even a sequence where Sonic is riding on top of a spaceship, dodging laser fire. It gets ridiculous rather quickly, and every stage has a moment or two that really stand out. The biggest gameplay addition is that there’s a playable character that isn’t Sonic. No, it’s not Big the Cat or any of the many different friends of Sonic, but players get to create their own character called the Avatar. 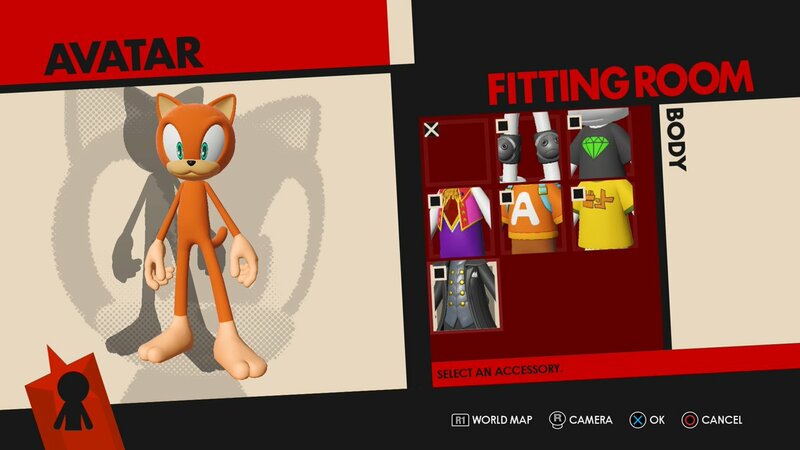 As a man of refined taste, I made my character an orange cat that looked like Bubsy (sadly you don’t get to name the characters). These characters all have different skills depending on what type of animal they are (for example, my cat regained some rings when hit), and use elemental weapons (such as a lightning whip) called wispons during combat. Oh, and you also get to dress up your character with a wide array of costumes (I wound up making my Bubsy wear a Persona mask). I found that the best levels were the ones where Sonic and my Persona 5-cosplaying Bubsy paired up. That’s because players get full access to both of their abilities, and it gives the players a lot more options. Being able to boost through sections, use a grapple hook, dash, and use the wispon weapon (which was a giant flamethrower in my case) makes combat really enjoyable. It’s really too bad that the game didn’t lean harder into this direction, as using a single character just feels limiting at times. A lot of the story revolves around the new villain, named Infinite, that is portrayed as the ultimate edgelord. He’s the best villain that the series has had in quite some time, as he just loves destroying everything he sees (highly relatable! ), and has zero redeeming qualities. His (sort of hilarious) backstory is revealed in the free Episode Shadow DLC, and I looked forward to his in-game appearances since his theme (which SEGA seemingly unearthed from the early aughts) is one of the best songs I’ve listened to in quite some time. Infinite winds up being the perfect foil for Sonic and friends, and his special abilities means that players will be seeing a lot of familiar faces from past Sonic titles (like Zavok from Lost World). In fact, the game is just chock-filled with references to past titles from stages (the Death Egg makes several ridiculous appearances) to the most random side-characters popping up as members of “the Resistance.” In many ways, Forces is a celebration of all things Sonic the Hedgehog. This theme is also seen in gameplay, as like Generations, there are some classic stages that star the adorable chubby version of Sonic. Sadly, these 2D sections are the weakest moments in the game, as the level design often features segments that revolve around tight platforming and making specific jumps, which has never been the series’ strong suit. I wouldn’t go as far to classify these levels as bad, but they’re largely mediocre. Thankfully, there’s only a handful of these stages, and they do little to take away from the ultimate enjoyment I had with the game. I found myself living for the cutscenes and dialogue exchanges within Sonic Forces. You’ve got Knuckles channeling his inner Jean-Paul Sartre as he philosophizes throughout. “None of this is good,” remarks the giant red echidna. “That’s why it’s called ‘war. '” It’s otherworldly to watch these hilarious looking anthropomorphic animals remarking on the atrocities of war through terrible dialogue, but it also absolutely owns. Forces is filled with these scenes, and they’re just so ridiculous that I couldn’t help but love it. This isn’t a story I’d traditionally describe as strong, but I’ll be damned if I wasn’t more invested in it than most games that attempt to be serious. What other game is going to feature a character going through months of traumatic torture and imprisonment, only to make jokes about eating chili dogs mere minutes after escaping? It’s incredible. Moment after moment stands out, such as when my Bubsy-wannabe character was nervous about facing off against the main villain and then Sonic appeared in his mind to give a motivational speech. There’s also some Hideo Kojima-style social commentary near the end, as Sonic gives a heartfelt monologue about how destroying evil is just the beginning, and people must work together to “fix the real world we all live in.” It’s corny as all hell, but maybe we could all learn a lesson or two from this talking hedgehog? The main story of Sonic Forces wraps up after a handful of hours (it took me around six), but I felt totally satisfied by what I had saw. I don’t want to spend 30 hours going through scripted Sonic stages, but I’ll gladly spend an afternoon or two being entertained by it. For those that want more bang for their buck, though, there are plenty of missions (including some daily challenges) to finish, and different costumes for the Avatar to unlock. Speedrunners in particular should have fun trying to find the best level routes, and trying to get the best times on the leaderboards. Sonic Forces review code provided by publisher. Version 1.01 reviewed on PlayStation 4 Pro. For more information on scoring, please read our Review Policy here.